map high-level requirements features onto planning elements of the governance framework. map the requirements features onto PRINCE2 work packages. Usually, I find that the PRINCE2 stage ends are already aligned with higher-level corporate governance process, such as MSP. This is an opportunity to make life easier for your PM by asking what sort of information on which he/she has to report. For example, if the organisation uses EVA, you may be able capture the basic elements in your agile method with at without any extra work to you or the team. This could earn you kudos! The low-level tracking from the agile method is rolled-up to work package level where the Project Manager's formal tracking and reporting upwards occurs. If aligned correctly, this allows the team to focus on delivery while giving the PM the required governance information. 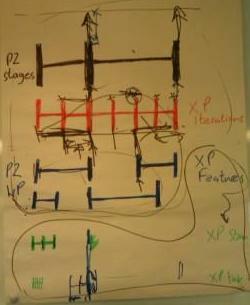 In the diagram, the black bars at the top represent PRINCE2 stages. The orange bars underneath represent delivery iterations. Next, the blue bars represent PRINCE2 work package mapping onto system features. The smaller, green bars at the bottom show the system features decomposed into smaller tasks.